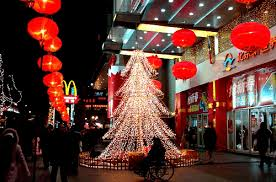 In China, only about one percent of people are Christians, so most people only know a few things about Christmas. 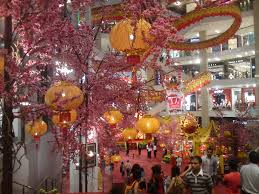 Christmas in China, is only often celebrated in major cities. In these big cities there are Christmas Trees, lights and other decorations on the streets and in department stores. The strange thing is that most of the world’s plastic Christmas Trees and Christmas decorations are made in China, but the people making them might not know what they are for!!! A tradition that’s becoming popular, on Christmas Eve, is giving apples. Many stores have apples wrapped up in colored paper for sale. People give apples on Christmas Eve because in Chinese Christmas Eve is called ‘Ping An Ye’ (which means quiet or silent night) and the word for apple in Chinese is ‘Ping Guo’ which sounds similar. In Chinese Happy/Merry Christmas is ‘Sheng Dan Kuai Le or 圣诞快乐’ in Mandarin. In China, Santa is known as ‘Sheng dan lao ren’ (Simplified: 圣诞老人; means Old Christmas Man).